With a population of standing at 23.1 million people, Australia is both a country and a continent enclosed by the Pacific and Indian oceans. Its principal cities – Sydney, Melbourne Brisbane, Adelaide, Perth – are coastal. Canberra Its capital, is inland. The country is known for its Sydney the Great Barrier Reef, Opera House, unique animal species like duck-billed platypuses, kangaroos, and a vast interior desert wilderness called the Outback. Australia’s capital is Canberra, inland from the country’s southeast coast. Surrounded by forest, nature reserves and farmland, it earns the nickname “Bush Capital.” The city’s central point is Lake Burley Griffin, filled with kayaks and sailboats. 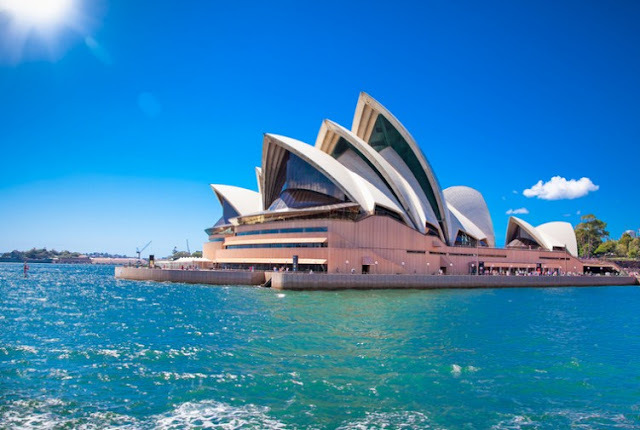 On the lakeshore is the massive,museums including the National Gallery, known for its original art collectionsas well as strikingly modern Parliament House, Sydney Airport is an international airport located eight kilometres south of Sydney CBD, in the suburb of Mascot. Sydney Airport is both the oldest commercial international airport in the world and the longest continuously operated commercial airport, the world’s oldest operating commercial airport continually, and the busiest airport in Australia, handling 35 million+ passengers in 2011. Most of Australia is rather temperate year-round. Being situated in the southern region, its seasons are opposite to those in the United States and Europe. The northern tropical zones have Dry (April to October) and Wet (November to March) seasons instead of usual four seasons. The subtropical, tropical zones can hit an aggregate of 32°C (89°F) in the Australian summer. If you want to experience snow, you’ll have to head to the highlands and mountains. Don’t miss these iconic Australian sites. From Sydney’s the Great Barrier Reef to urban vibe to the Outback there’s something for everyone. Book a date to visit the Great Ocean Road. Australian wildlife is a central point of attraction for visitors from different parts of the globe. After all, how often do you get a chance to feed pet koalas and kangaroos? Arguably two of the cutest animals on the globe, Feather dale Wildlife Park is the most famous place to see these kinds of creatures. Lone Pine Koala Sanctuary in Brisbane- the largest Koala Sanctuary in the world where visitors get an opportunity to spend time with koalas. If eating great food is your idea of a complete vacation, Australia will not disappoint. Some of the best food choices at every corner and nook, most cities in the Australia are brimming with restaurants, cafes, bars, street side shops, and pubs offering delectable dishes from varied foods like Italian, Arabic, French, Mediterranean, Chinese, Thai, etc. Whether you want to choose a place for a classy dinner date or just want to gorge without putting a dent in your wallet- Australia has a little something for every visitor. If you are a Seafood fans, you should celebrate a tad more because it is the most readily available across the continent, and no one loves their chips and fish like the Australians. Food trails in the country are a hit among visitors, especially the ones in Sydney and Melbourne. The nightlife in Australia is phenomenal, exceptional, and one of the most exciting around the world. A hub of casinos, pubs, and strip clubs make Australian cities bright as the morning sun goes down on weekend nights, the major hotspots being in Melbourne, Perth, Gold Coast, and Sydney. The most chilled out of them all- Gold Coast hosts the classiest parties. Surfers Paradise is a one of a kind and the largest, keeping in mind the vivid collection of bars and pubs; while SimCity, Vanity have gained recognition as the most popular clubs in the vicinity. Join a historic tour of Sydney’s best pubs. Tipping is no anything that is allowed in Australia. Employees are paid a reasonable wage with bonuses, so they don’t rely on tips. In fact, some Australians will consider it insulting if you give them a tip. Whether you want a luxury a chic city retreat, a contemporary golf destination, or beachfront resort, these are some of Australia’s top hotel picks. This Autograph Gathering, features contemporary chiccombined with bizarre Federation-style architecture. lyingside by side with the Sydney Harbour Bridge and giving magnificent wide views of Sydney Harbour, Pier One Sydney Harbour is constructed on and over the water. Lizard Island Resort on Lizard Island is the northern-most hotel located directly on the Great Barrier Reef, with 40 luxurious suites and 24 powdery-white beaches. Enjoy five-star cuisine in the beautiful Salt Water restaurant, secluded picnics and sunset beach dining on private beaches, and indulgent spa treatments in the Essential Day Spa. It is an award winning, five-star hotel set in the heart of Sydney’s CBD. Thedeluxe hotel is engulfed by Sydney's most unique designer theatres, classy shopping, best restaurants, and nightlife, and is close to attractions like Sydney Opera House, the Harbour Bridge, and Darling Harbor. With imposing mountains, gorgeous beaches, stunning deserts and more to choose from, Aussies are big on the great for gate-away. Try some of these exciting outdoor activities when you visit. Australia offers some culinary masterpieces you will find nowhere else. There’s more to dining Down Under than throwing a shrimp on the Barbie!